You are cordially invited to participate in our VIP sponsorship Program! This unique approach is designed to attract quality people like yourself to our school. We find that the majority of our students are recommended to us by someone who already trains with us… We greatly appreciate your support and kind words! 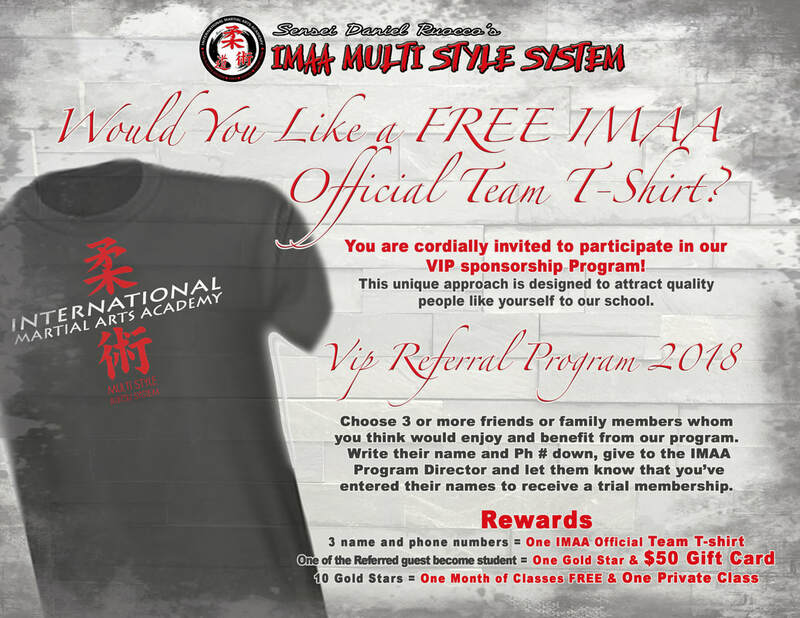 Don’t keep martial arts a secret; it’s easy to get someone you care about involved in our program! Choose 3 or more friends or family members whom you think would enjoy and benefit from our program. Place their names and information on the form below. Then, let them know that you’ve entered their names to receive a trial membership. There is never a limit to the number of friends you can refer. The highest honor and greatest respect you can show your instructors is to compliment and refer your Dojo to others. IT'S EASY TO GET STARTED. Insert your guests info below and start to redeem you gold stars points!